If you are looking for information on the Nestle Toll House Cafe franchise business opportunity, Nestle Toll House Cafe franchises or Nestle Toll House Cafe franchising, then you have come to the right place. Nestlé Toll House Café by Chip is the only major, national dessert café that features top-quality branded cookies, baked goods, coffee, ice cream and smoothies. Nestlé products offer strong brand recognition, consumer awareness, and brand loyalty. Brands such as Toll House, Nescafe, Nesquik, Butterfinger, Nestle Crunch, Edy's, and Dreyers Ice cream are all part of the main menu. 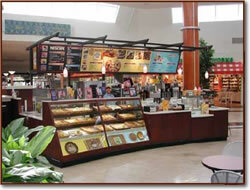 Franchise opportunities are available in a variety of formats - Kiosk, In-line and Street Cafés. We all have a dream. The question is how do you live out your dream? The first step is to visualize your dream and construct a plan. Decide what you expect from owning a business. Are you looking for financial freedom? Is a career change what's important to you? What do you expect from your Franchisor? Understand your strengths and weaknesses and determine if franchising is right for you. Do you have the desire, motivation and financial capacity to own and operate a retail/food business? Do you have the knowledge and expertise that would prove helpful, such as a business background or management experience? Are you prepared to work hard and face challenges head on? Do you like working with and meeting people? Do you have a location in mind? Be Prepared: Learn everything you can about Nestle Toll House Café, from our rich history and wonderful products offered in the cafés. Complete the Franchise Application: Fill out a convenient web form. There is no obligation to buy however it tells us you're interested in our franchise. After receiving our application a member of our Franchise Development Team will be in contact with you. Receive and Review FDD: Qualifying franchise applications will be invited to receive our Franchise Disclosure Document ( FDD). This document contains specific information about the Nestle Toll House Café, the Franchise Agreement, Financial Statements, and a listing of existing Franchisees that you can contact, and other information pertinent to owning a Nestle Toll House Café Franchise. Get Answers to Your Questions: Call your Nestle Toll House Café Franchise Development Specialist with any questions you or your advisors may have. If you are ready to continue in the process, you may wish to form a Legal Entity for your new business. Prepare the Franchise Agreement: We will prepare the Franchise Agreement and send it to you. After the required waiting period, you can submit your signed Franchise Agreement and Franchise Fee to us for final approval by our Executive Committee. If, for any reason, your Franchise Agreement is not approved, your Franchise Fee will be returned to you immediately. Secure a Café Location: You will be provided a number of tools to assist with your evaluation and selection of your café location. A member of our Real Estate Team will be available to assist with this process and help you find the location that is "just right" for you. Begin Store Design and Construction: The Design and Construction Department will assist you in assembling your café build team, and then the construction process can begin. Our Franchise Development Manager stays in contact with you throughout the design and construction phase. 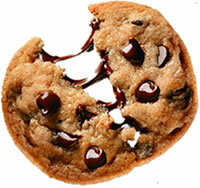 Comprehensive Training: Within two months of your opening, you will attend the Nestle Toll House Café Training course. This is a comprehensive ten day program offered at our corporate headquarters in Richardson, Texas. Grand Opening: Congratulations! Your Café is having its Grand Opening! The Franchise Support team is there to support you. Marketing tools are utilized to spread the word to the surrounding community to get their mouths watering! This franchise opportunity offers America the brand they have trusted for years!